Cross Country Vehicle Transport - 5 important shipping tips. Shipping your car across the country means it’s safe arrival is out of your hands. Here are a few tips to make cross country car shipping less stressful with proper preparation. Are you moving to a new city across the country and planning to ship your vehicle there? If you want the shipment to be as smooth as possible, you should make sure that you work with an experienced cross-country car shipping company. You want to find a company that knows how to get your car, truck, or SUV from point A to point B without any problems. That isn’t the only thing you should do to reduce the stress you’ll likely feel when you ship your car across the country. Let’s check out some of the other ways you can make cross-country car shipping stress free. Car carrier of Truck series. New autos coming.Here are 5 tips that will help you…. In the event of an accident involving your vehicle, will the cross country car shipping company’s insurance policy cover it? This is one of the first questions you need to ask because you aren’t going to have any control of your car once it gets shipped. You want to make sure your vehicle is safe and that the shipper’s insurance covers it in case anything goes wrong. Most reputable car shipping companies have liability insurance that covers at least $50,000. There are some that have insurance that covers up to $250,000. Ask how much your company’s insurance will cover, depending on the make and model of your car and its current condition. The last thing you want is to find out that your car won’t be fully covered under a shipper’s liability insurance policy. Most cross-country car shipping companies tell you to remove everything from your vehicle before shipping it. Companies don’t want to be held liable for items you leave in your vehicle, and they don’t want to ship a car that weighs any more than it has to. You should remove any loose valuables from your vehicle. You might also want to disassemble parts in it that are valuable to you. It can be a hassle to remove some of these items from a vehicle, but just in case, you might want to consider taking the time to do it. If something ends up happening to your vehicle during shipping, you’ll be glad you did. Before you allow a cross-country car shipping company to take ownership of your vehicle temporarily, it’s a great idea to take numerous photos of your car and everything inside of it. You should try to take photos of every part of the outside of the vehicle and as much of the inside as you can access. Try to use either a smartphone or a digital camera to do this so everything in your photos is clear. Once you take the photos, store them on a flash drive or transfer them to your computer. If your car reaches its final destination damaged, you will be able to prove that the damage wasn’t a result of any wrongdoing on your part. In reality, it’s not a bad idea to take photos of everything you ship. You should be especially mindful of doing it when you ship something as expensive as a vehicle. 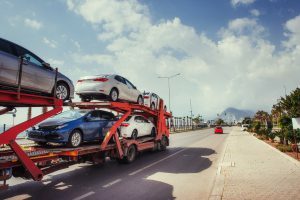 Most cross-country car shipping companies won’t be able to tell you exactly when your car, truck, or SUV is going to arrive on the other side of the country. They should, however, be able to give you an approximate day and time when you can expect it. This will set your mind at ease because, if nothing else, you’ll know around when it will be arriving. If it doesn’t arrive by that time, then you might have every reason to worry about its safety. Until then, all you can do is wait for it to show up and trust in your shipping company to take care of it. Most people don’t have any experience when it comes to shipping a car across the country. They’ve never had to do it, so they don’t have the slightest clue about where the car will be when it’s shipped or the shipping process. If you’re in this boat, don’t be afraid to ask as many questions as you want! A good cross-country car shipping company will take the time to answer every question you have about your vehicle. If you don’t ask questions, you will likely be a nervous wreck while waiting for your car arrival. You have enough other things going on during your move, so why add this stress on top of it? By getting answers to your questions, you will be able to sleep better at night. You will also be able to get a better sense of how qualified a specific company is to ship your vehicle. If at any point they aren’t able to answer a question or, worse, if they simply refuse to answer a question for you, they might not be the right company for you. You should never feel bad about asking questions in regard to your property. You want someone who will reduce your stress, not add to your problems. Need help with your cross-country car shipping? You can get a quote today and hear more about how easy it is to ship your vehicle anywhere in the country in short amount of time. Take a look at our blog for additional tips on shipping a vehicle and working with a company you can trust.